“We unveiled this project at our Sheep Event in July last year and have been working on it ever since, particularly to bring together the different elements of NSA’s existing activity for young people, such as our Young Shepherd of the Year competitions, the scholarships our regional committees offer, and helping people find work experience placements and employment within our network of farmer members,” said NSA Chief Executive Phil Stocker, speaking at an on-farm event in Wiltshire. The event, held jointly with RASE, had a very positive feel and attracted around 60 young people interested in getting onto the sheep farming ladder. It was hosted by Tim White, a first generation farmer who opened the gates at Manor Farm, Sutton Mandeville, Wiltshire, and spoke about his experience of having no family farm business behind him but building up a thriving enterprise, now running a flock of Exlana sheep on rented ground over a 100-mile radius. He was joined by four other speakers (one via video) all under the age of 35 and running successful sheep farming businesses. 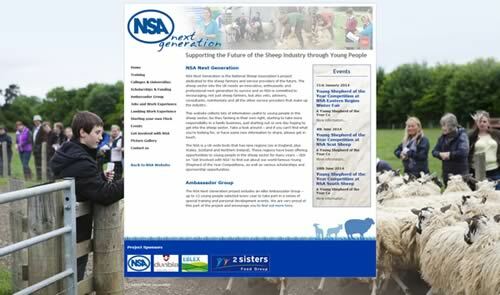 Phil Stocker continued: “Today was the perfect opportunity to unveil the next phase of NSA Next Generation, which now has its own branding and a dedicated website signposting young people to opportunities within the sheep sector. The new website provides links to training, funding and scholarship opportunities, it lists colleges and universities around the UK offering agricultural courses, and offers advice on starting your own sheep flock. It also brings together all the existing NSA activity, including our very popular matchmaking service for students looking for on-farm placements at lambing time. The website will be added to over time and we welcome comments from people with suggestions for additional content. “NSA was also delighted to open the application process for the NSA Next Generation Ambassador Group 2014 today, which is the next stage of our project and something we are very excited about. By the end of this year we will have selected up to 12 young people with a real enthusiasm for the sheep sector and provide them a unique experience throughout 2014, offering technical and personal development, covering elements such as market selection, food chain development, sheep husbandry, brand development and adding value, optimising genetics, time management, business planning, presentation skills, conflict resolution and promotion of the sheep sector. With ambassadors selected from England, Wales, Scotland and Northern Ireland, the programme will provide the opportunity to meet likeminded people throughout the UK, as well as key people within the sheep sector.